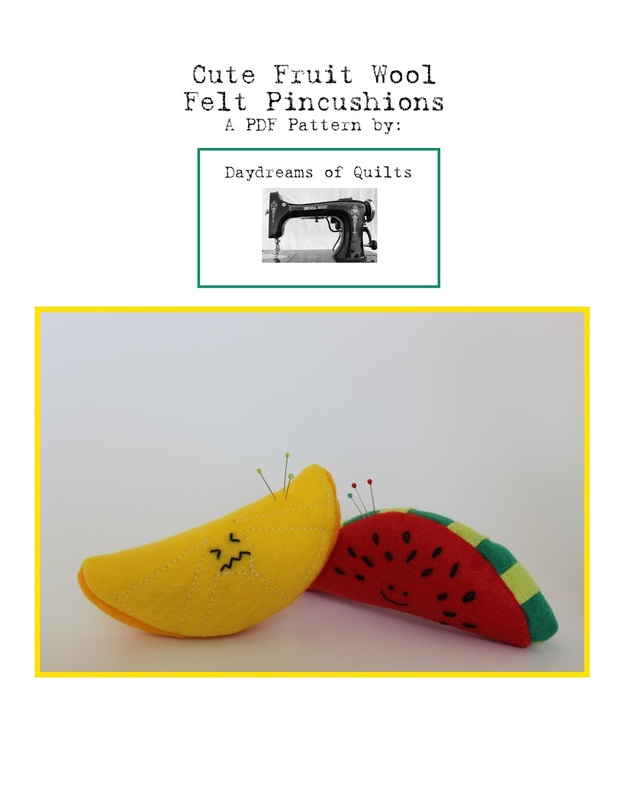 Daydreams of Quilts: Cute Fruit Wool Felt Pincushion Pattern Release! Cute Fruit Wool Felt Pincushion Pattern Release! I am on a roll this weekend it seems. Apparently all it takes for me to get a lot of things finished is to have my husband working all weekend and myself at home with three kiddos. But I digress! Here is my newest pattern that I am so happy to show you! Just in time for spring and summer sewing here in the Northern Hemisphere. Cute Fruit! These Fruities are cuties! :) Naturally we enjoy these adorable fruits year-round so my Southern Hemisphere friends can stitch them up too. Cute Fruit pincushions by Daydreams of Quilts. You can find this pattern in my Etsy shop and my Payhip shop. I had so much fun creating these little guys! This is a PDF pattern to make adorable wool felt cute fruit pincushions. There is a lemon and a watermelon. (Of course you could also use green or orange felts to make limes and oranges too! Or even a honey dew or cantaloupe for that matter!) The PDF is nine pages (with cover page and pattern template page) and includes photos, a tutorial link for embroidery stitches, pattern pieces and supply list. I made my samples while my baby was napping so you could have these little guys made up in a couple of hours.